Last Christmas I had fun making a layered mix for blondie bars that had a holiday flair using mint green chips. 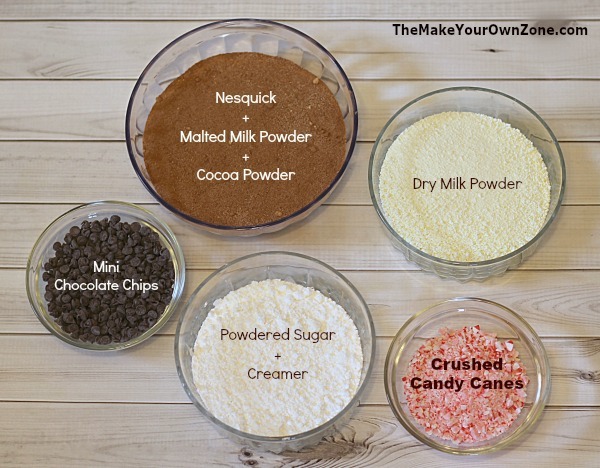 This year’s recipe for a hot cocoa mix has a festive touch too, thanks to the layer of crushed candy canes. 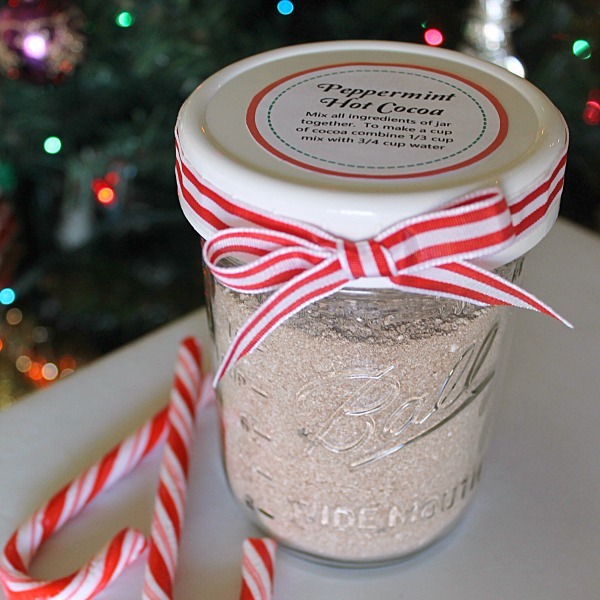 I kept the decorations for these jars simple and just used a ribbon around the lid so that the layer of candy canes could still show through. (I like to use these plastic storage caps on the tops of my jars). 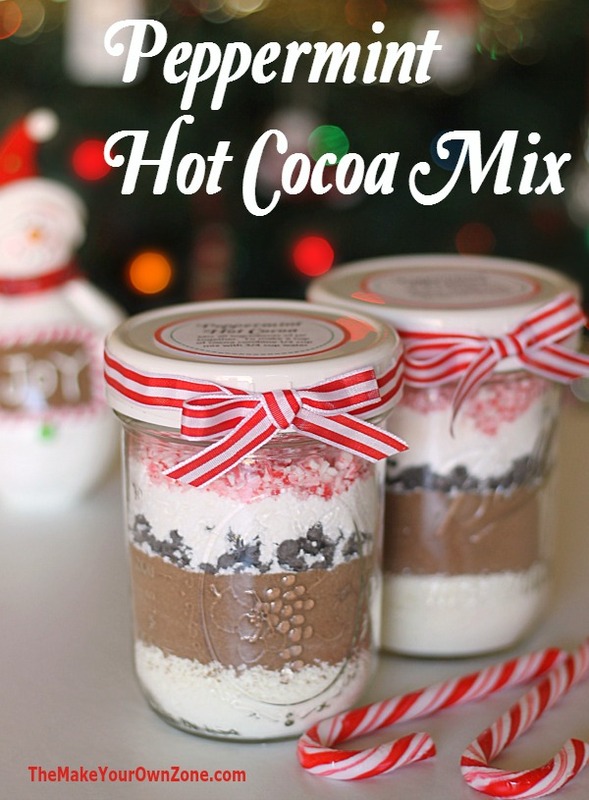 One item of note in this mix is that it includes mini chocolate chips. When making a cup of cocoa, the chips add a very nice chocolate flavor but they don’t always melt up right away. Sometimes they want to glop together. If this is a concern, you can simply leave out the layer of mini chocolate chips. And as you will read farther down in the instructions you don’t even necessarily have to layer this mix. It can work just mixed all together too. In a bowl, mix together the Nesquick, malted milk powder, and the cocoa powder. In another bowl mix together the powdered sugar and the creamer. Now your ingredients are ready to layer into jars. To make layered jars: This recipe will make enough for two (pint size) jars – OR – one (quart size) jar. 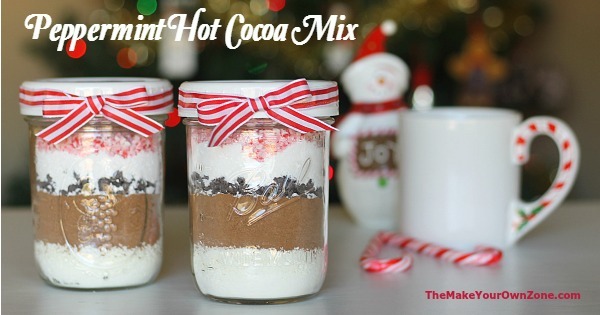 If you don’t want to take the time to layer – OR – you want the recipient of your gift to be able to easily use the mix without the extra step of them having to mix the layered ingredients together, then you can just pre-mix all the ingredients yourself and pop them in a jar (see the photo below). It’s all good! 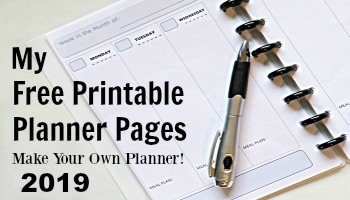 Here’s a link for a printable label too. This includes a label to use with layered jars as well as a label to use with non-layered jars.